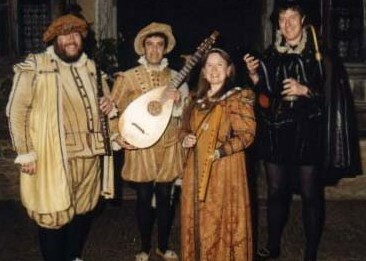 Medieval and renaissance vocal and multi-instrumental quartet, costumed appropriately for early music. 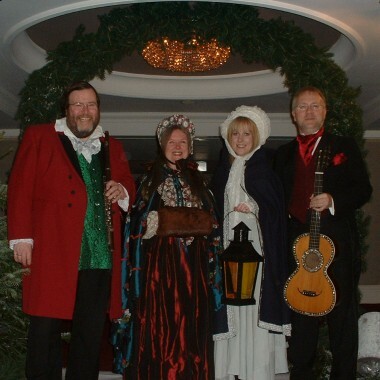 Also have themed and costumed shows covering British folk, Tudor, Victorian, light classical or Christmas carols, all accompanied on original or replica period instruments. 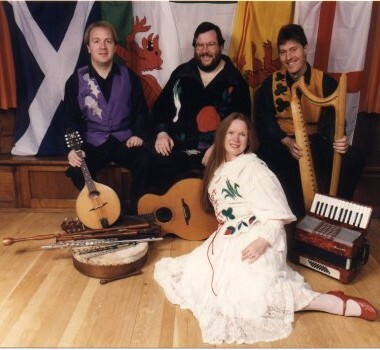 Dragonsfire specialises in instrumental music and song from different periods of history. Dragonsfire has a reputation for total reliability and complete professionalism. The members of this quartet are all very experienced professional musicians and the group is also covered by public liability insurance. Ideal for corporate events and private functions, dinners, receptions, product launches, conferences, weddings, concerts and lecture-recitals, their music helps create the perfect atmosphere to make your function a success. Dress can be either formal bow tie and dinner jackets, or full costume of the relevant historic period or theme. The music can be played in one static position, or movable to different points, (for certain themes, it is possible to be strolling while playing). 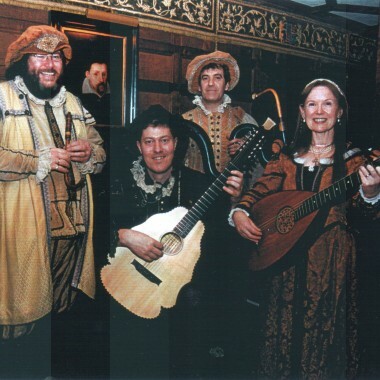 Tudor / Renaissance (16th century) – recorders, crumhorns, cornamuse, rackett, lute, bandora, four course guitar, psaltery, bass viol, harp, hammer dulcimer, serpent. Greensleeves, Silver Swan – Orlando Gibbons, Now is the month of Maying – Thomas Morley, Come again! Sweet love doth now invite – John Dowland. Dance tunes – Pavan, galliard. Georgian – (18th century) – recorders, flute, guitar, mandolin, viola da gamba, serpent, harp. Arrangements of well known compositions by Mozart, Haydn, Beethoven. Themes from sonatas and symphonies, arrangements of piano pieces. Dance movements – Minuet, Landler, Waltz. 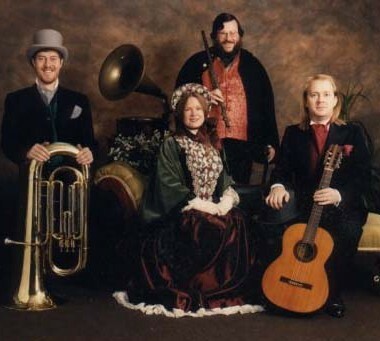 Victorian – (19th century) – flute, guitar, mandolin, hammer dulcimer, serpent, tuba, accordion. Parlour songs, Music Hall songs, Victorian folk songs – The last rose of summer, Cockles & Mussels, Come into the garden Maud, My grandfather’s clock, Down at the old Bull & Bush. 1960s – flute, bowed psaltery, guitar, mandolin, autoharp tambourine, finger chimes. Tom Paxton, John Denver, Ewan McColl, Bob Dylan, Pete Seeger, Joni Mitchell, Paul Simon. Blowing in the wind, Where have all the flowers gone? Both sides now, Amazing grace. Instrumental medleys of Beatles songs.